Once all the data is available, ParkServe will include green space information from nearly 14,000 cities and towns in the United States. ParkServe is a new interactive platform from The Trust for Public Land (TPL) that park planners, city officials, and park advocates can use to map and analyze parks nationwide. When all the data is available via the platform later this spring, ParkServe will include green space information from nearly 14,000 cities and towns in the United States, covering where more than 80 percent of the country’s population lives. 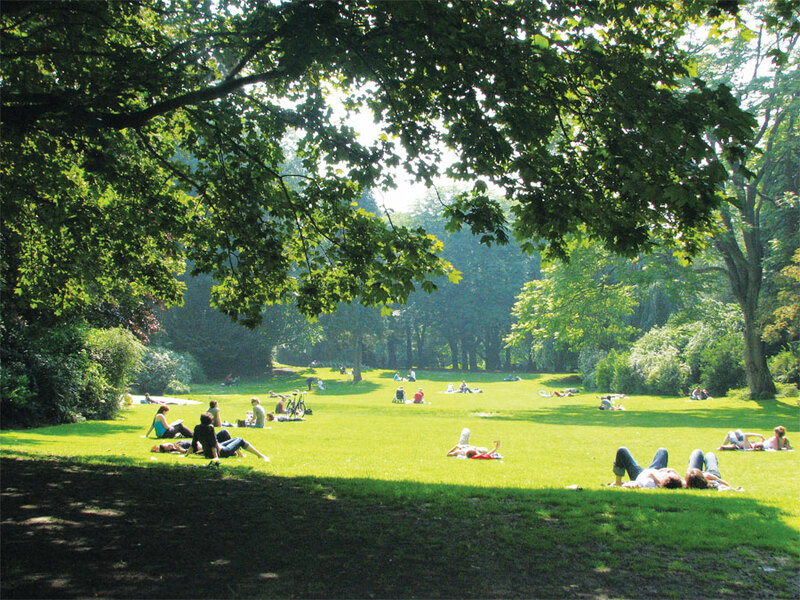 The web-based platform, which currently contains approximately 130,000 local and urban parks, enables users to locate the nearest park, determine the percentage of residents in a city or town that live within a 10-minute walk of a park, and identify neighborhoods that are most in need of new parks. Built on the ArcGIS platform, ParkServe expands on the success of TPL’s widely acclaimed ParkScore Index, which ranks park systems in the United States’ 100 largest cities. Like ParkScore, ParkServe is a free, publicly accessible, web-based system that includes data and analytics on park systems across the nation. Users can access an extraordinary amount of parks data that was previously available only to well-funded municipal parks researchers. To develop ParkServe, TPL’s GIS team had to collect and verify park data, build the 10-minute-walk park accessibility tool, and model the TPL’s plans for sharing the data. Here’s how the small team did that, with ArcGIS underpinning the entire process. Statistics for the city of Brooklyn Park, Minnesota, were generated by a Python script that used the ArcPy site package. The ParkServe platform provides a stand-alone, standardized database that can easily be incorporated into existing databases of federal, state, and local parks and protected lands. Creating the data involved working with thousands of local partners in a multistep process to ensure that the most accurate and up-to-date data is included. TPL contacted each city, town, and community included in ParkServe via phone and email to request their parks data. If no GIS-based park data was provided, the ParkServe team created data for the area based on available resources, such as park information from municipal websites, GIS data from counties and states, and satellite imagery (from Esri’s World Imagery basemap, for example). GIS analysts and interns compiled and loaded the data into a standardized schema based on the US Geological Survey’s (USGS) Protected Areas Database of the United States (PAD-US) standards. To ensure consistency within the database, GIS analysts and project managers streamlined the compilation and loading process with Python scripts that used the ArcPy site package. After TPL’s GIS team loaded the initial data into the standardized parks database and verified it, each community was given the opportunity to review the data and verify it for accuracy. To facilitate the review process, TPL created ParkReviewer, a web app that partners from municipal and local parks could use to confirm that all the publicly accessible parks in that community had been mapped correctly. Upon completion of the verification process, TPL staff reviewed all edits using ArcGIS Data Reviewer to compare versions of the database and ensure that it still included everything they intended it to cover. The team then reconciled acceptable edits and posted them to the base version of ParkServe. 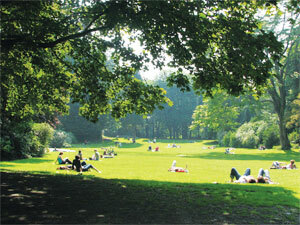 One of TPL’s core visions is that all US residents live within a 10-minute walk of a high-quality park or green space. A major component of ParkServe is being able to do proximity analysis using demographics to measure how equitable access to green spaces actually is. Using the ArcGIS Network Analyst extension in StreetMap Premium for ArcGIS as the base road network, GIS analysts and interns created 10-minute-walk service areas for each park. These service areas were used to visualize and analyze the populations living within a 10-minute walk of every green space. The team then generated park access statistics not only for each park but also for every one of the 14,000 ParkServe communities and the encompassing US Census-defined Urban Areas in each community. Analysts and interns further analyzed park access statistics in several demographic categories—including race and ethnicity, age, and household income—since those categories offer a lens into the equitability of park access. 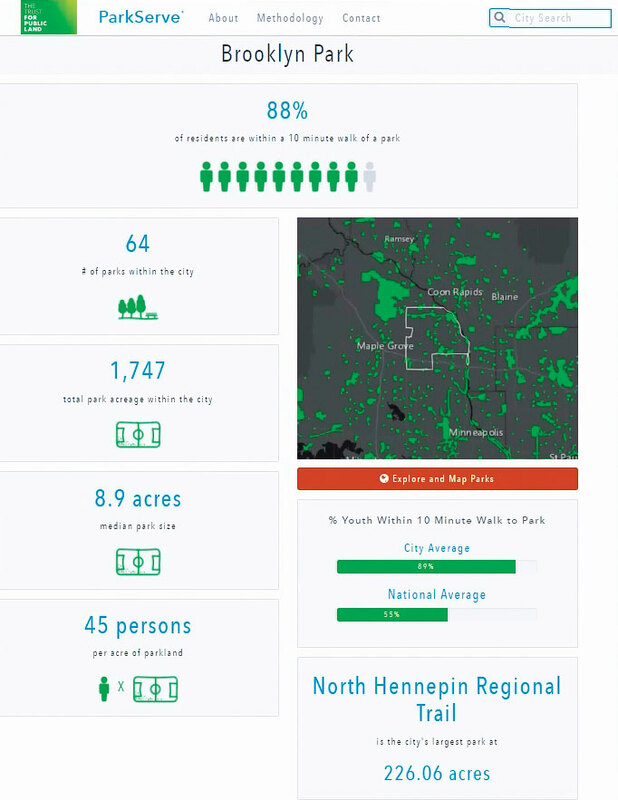 The additional outputs created included a park need layer that uses a weighted overlay of several demographic statistics to highlight where parks are needed most for each community and urban area, as well as an optimized points layer that highlights potential park locations that would serve the most people and therefore have the biggest impact on improving a community’s park accessibility. Using the ParkReviewer tool, users could add missing parks to the database, edit the attribute information, and suggest new boundaries for existing parks. TPL plans to share the ParkServe data widely and make it easily accessible in a variety of formats. This summer, GIS users will be able to download the data at multiple geographic scales and access it through public REST end points from the ParkServe website. ParkServe data will also be included in the PAD-US dataset from USGS. Additionally, the ParkServe website enables non-GIS users to view park information for communities across the United States; understand detailed information about park needs; generate park access reports; and even sketch new parks, complete with demographic profiles of who would live around them and what the potential impacts would be. Going forward, TPL’s priority is to incorporate user feedback into ParkServe as quickly as possible. Despite the thorough quality control and verification processes that were performed during data creation and aggregation, TPL will need to continually make edits and updates on things like parks’ geometry and attributes, the 10-minute-walk service areas, and the park access statistics. For example, TPL might eventually need to add new parks; change the boundaries of existing parks; denote parks that are no longer part of a parks system; or edit a park’s nonspatial attributes, such as who owns or manages it. Soon, users will be able to propose edits—such as the location of a missing park—directly in the ParkServe web platform. And in future phases, GIS users will be able to directly upload their GIS datasets into the standardized ParkServe database. In addition to refining its accuracy, TPL plans to add more detail to the data. Beginning this summer, TPL’s GIS team will add data on park amenities and park quality. For this effort to work, the team will take multiple approaches, from gathering and creating the data manually to putting crowdsourcing and other community-generated data-gathering techniques into practice. By enriching the ParkServe database with this kind of information, TPL, its partners, and communities will be able to answer questions such as Where is the closest park with a swimming pool or basketball court? Doctors will be able to use the database to write ParkRx prescriptions, which are intended to help patients with chronic diseases get out into nature and be more physically active. And park advocates will have new resources to show community officials that demonstrate which neighborhoods in their communities are desperate for playgrounds and walking trails, as well as which nearby parks are in need of care. To view the ParkServe platform, visit parkserve.org. TPL welcomes feedback from all users via the Contact page (for now) or by contacting Emmalee Dolfi at emmalee.dolfi@tpl.org. Emmalee Dolfi is the GIS senior project manager for ParkServe at TPL, and Gabriel Patterson-King is a GIS analyst for the organization.